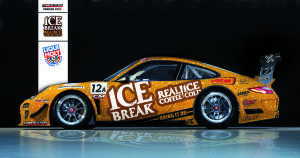 Ice Break Competition Motorsports will return to Mount Panorama and the Liqui-Moly Bathurst 12 Hour in 2015, this time in a bid for overall honours. After competing in the previous two 12 Hour events in Class B, Ice Break Competition Motorsports will next year challenge the world’s leading GT teams and drivers armed with a Porsche 997 GT3R in Class A, the outright class for FIA GT3 specification cars. The Ice Break Competition Motorsports program will once again be headed by USA-based Australian, David Calvert-Jones, who will be joined by American sportscar star and Porsche factory driver Patrick Long, and V8 Supercars Dunlop Series ace Chris Pither. For the third year in succession, leading Australian-based Porsche squad McElrea Racing will provide personnel and infrastructure for the entry, supported by American Bob Faieta of Competition Motorsports. In the 2014 race, Calvert-Jones, Long and Alex Davison finished ninth outright and second in Class B, having led the class until suffering two late-race tyre punctures. Since last February’s 12 Hour, Calvert-Jones has won races in the IMSA Porsche GT3 Cup Challenge (Platinum Masters division) and has driven a Porsche 911 in the Tudor United Sportscar Championship (GT Daytona class) as well as a Ford Mustang in the Continental Tire SportsCar Challenge. Long raced for Porsche North America in this year’s Tudor United Sportscar Championship, where he was crowned one of the Tequila Patron Endurance Cup Champions (GTLM) and won the GTLM class at the 12 Hours of Sebring. Long’s extensive season of international sportscar commitments included the Californian’s 11th start in the 24 Hours of Le Mans, where he partnered Hollywood actor/ racing driver Patrick Dempsey for the second successive year. Long was recently confirmed as one of Dempsey’s team-mates for a full assault on next year’s FIA World Endurance Championship with the Proton Competition team. Kiwi Pither is a new addition to the team, but comes with significant Bathurst experience including three starts each in the Bathurst 1000 and 12 Hour, as well as a 12 Hour Class E victory in 2012. Pither is also a former V8 Ute series champion and this year registered his first ever Dunlop Series race and round win in Townsville. The Liqui-Moly Bathurst 12 Hour will take place on February 6-8, 2015, and for the first time will be broadcast live in its entirety across Australia on the Seven Network. Kellie Green, Ice Break – Senior Product Manager: “Ice Break is a proud supporter of Australian motorsport and we are excited to continue our involvement with David and the Ice Break Competition Motorsports team. We are thrilled to welcome Chris Pither, a long term Ice Break brand ambassador to the already talented team and wish them. This entry was posted in News on December 22, 2014 by admin.